I absolutely love coming to work every day. My name is Deanna Schiff-Pasekoff and I am entering my thirty-ninth year as a Speech-Language Pathologist. On the UPMC Rehab Network at Montefiore, we see the most medically complex cases. We are a JCAHO Stroke Rehab Center of Excellence at Montefiore. Every day at work is different. It is so rewarding to see patients progress from being incredibly ill and debilitated to walking off the rehab unit and out that door. Often, when patients arrive on the rehab unit, they express little interest in being here…and when it’s time to leave for home, they express their gratitude and desire to stay. We always ask our patients to come back to visit but, NEVER to stay again. We work closely as a team on Rehab and as a team we set goals with our patients in order to optimize their function for a return to home. We love our patients and work with them to achieve their goals. I always tell my grad students that they have chosen the most fun profession in the world. My patients have taught me so much over the years–how to cook and plan great parties–in the act of performing problem solving tasks. Being a Clinical Instructor for PITT is my way of paying back the university I love. It also keeps me on my clinical toes because the students who I train are the cream of the crop. They truly know their stuff and they test me on a regular basis. Whew…it’s not easy being tested at my age! But, it’s an awesome experience and I am thrilled to be invited to participate in the learning experience of some of the finest students I’ve ever met. It is an honor to be a part of the Speech-Language Pathology Division in the Department of Otolaryngology. The Department is highly ranked nationally and I am proud to be a member of a world-class department. The SLPs in the division are expert in a wide range of disorders and we all benefit from a close-knit relationship and the ability to learn from each other. For instance, when there is a complicated head and neck patient on Rehab, we contact our Acute Care head and neck expert for guidance. 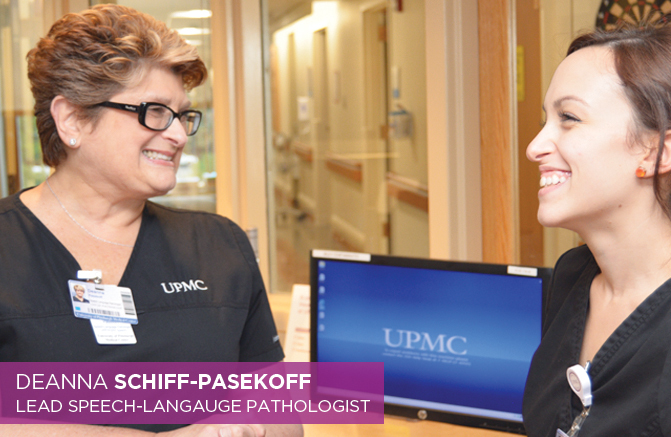 We have a wide range of clinical experts and many advantages here at UPMC: we have free on-site continuing education in the form of Swallowing Grand Rounds and Journal Club; there are outpatient programs in Foreign Accent Modification, TEP, MBS and FEES. The opportunities for professional and personal growth are endless. It has been a privilege to work with supportive Division Directors who lend their guidance and expertise whenever I call upon them. These are a few of the many reasons why I love coming to work at UPMC every day. To me, being a Speech-Language Pathologist is still fun, after all these years. It never feels like work. © 2019 My Career at UPMC.